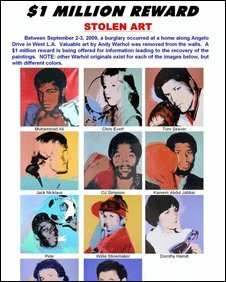 Police in Los Angeles say a multi-million dollar Andy Warhol art collection has been stolen from a private home in the city. 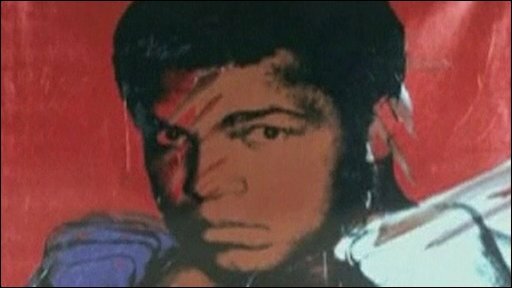 Among the missing works are 10 pieces created by Warhol in the late 1970s depicting famous athletes, including Muhammad Ali and OJ Simpson. They were taken from the house of businessman Richard Weisman. A portrait of Mr Weisman was also stolen. A $1m reward has been offered for information leading to their recovery. The silkscreen pieces, commissioned by Mr Weisman, are valued at several million dollars. Police said that the artworks - each one 40 inches (101 cm) square - had been taken on the 2 or 3 September. Their disappearance was discovered by a domestic employee, who found the dining room walls bare and alerted the police. Among the sports stars depicted in the series of the pieces were tennis champion Chris Evert, Los Angeles Lakers basketball great Kareem Abdul-Jabbar and Olympic skater Dorothy Hamill. Though the house was locked up at the time of the theft, Los Angeles police said the rest of the property had remained untouched and there was no sign of forced entry. "This was a very clean crime," Detective Mark Sommer said. "[The home] wasn't ransacked." He added that the Warhol collection of sports personalities seemed to have been specifically targeted for the theft as other artwork, including pieces by Warhol, had not been taken. "For some reason they had an interest in this collection," he said. Mr Weisman described the theft of the works as "a profoundly personal loss to me and my family". Andy Warhol, who died in 1987, became internationally famous in the 1960s for his iconic image of a Campbell's soup can and the social gatherings at his New York studio, "The Factory".